How do you define a road? It’s all relative – right? I had long ago left behind my vision of what a road should be once I started long term travel in places like Kenya Mongolia, Laos, and Vietnam. Shoulders are for sissies and horns are an art form. I thought I was used to dangerous roads, but today I met my match. I had my last apple pancake early in the morning with a strong cup of coffee. I was sad to be leaving the unique town of Marpha, but we had to keep to our schedule. We were still trying to make up days since we had taken longer than expected to get over the pass. Making up days was relatively easy to do since on this side of the pass because there are ‘roads’ – at least that’s what the locals call them. We went outside of Marpha and waited along the side of the road to catch a bus that would take us down the mountain into Tatopani. By foot this would have taken us two days, but by bus we were told it would take about 5 hours. We waited at the ‘bus stop’ with Bishnu, Diehl, and a handful of other tourists; we huddled together to stay warm on this chilly morning. We were still in the shadow of the mountain as the sun hadn’t risen high enough to bake us yet. 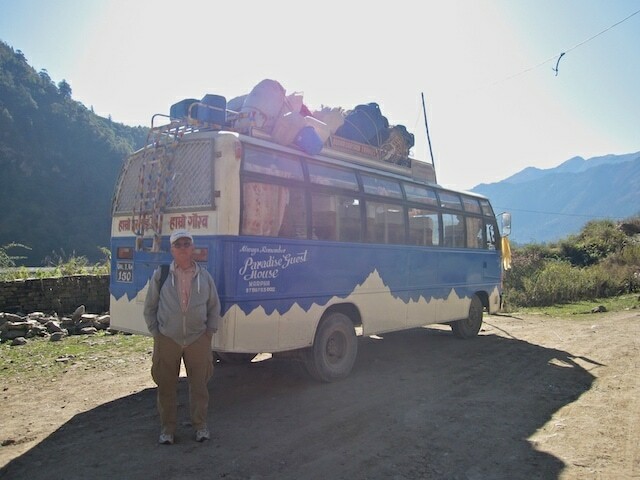 The bus of course was running on ‘Nepali’ time so we stood around and froze for an hour; our emotions dashed every time another bus passed us by.